In collaboration with the Division of Nursing, Midwifery and Social Work, the Peer Support team has developed a Basic Life Support Programme (BLS); a discipline-owned and student-led scheme which uses peer to peer training to equip our students in Basic Life Support skills. The training focuses on resuscitation, how to use an AED and responses to choking. 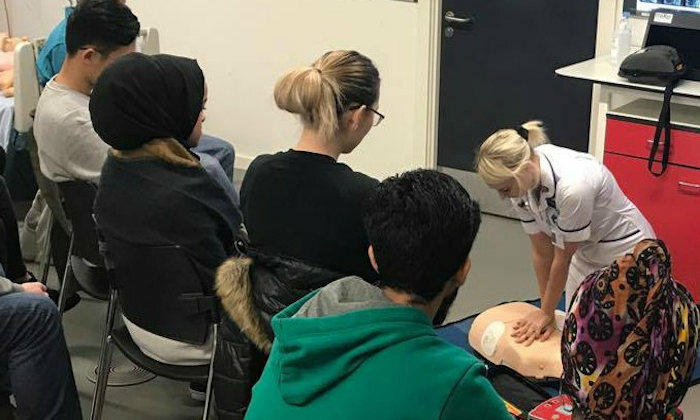 Aiming to provide Basic Life Support Skills, giving students the knowledge and skills to save someone’s life in an emergency situation, the BLS scheme has provided training to over 100 students from a bank of 23 trained volunteer instructors. Research from the British Heart Foundation shows that the efficient delivery of CPR to individuals experiencing cardiac arrests out-of-hospital can double the chances of survival. Jemima Lacey had her first real world lifesaving experience recently when she helped a man who had collapsed on Deansgate. Noticing he was in distress Jemima reacted calmly and quickly, assessing his symptoms and putting him straight into the recovery position. Describing the event, she says: "I was amongst the first of several passers-by to spot a man in need of emergency medical help on the floor. Generally, I am easily flustered under stress, but I managed to stay perfectly calm in this situation and this enabled me to give the best help possible to this man. Jemima, who is a Peer Support Volunteer, waited until the emergency services arrived. Commenting on her training, she adds: "I truly believe it’s something absolutely everyone should learn - you never know what kind of situations you might come across in public, and if taking a few hours out of your day to attend a Basic Lifesaving session means you could potentially save someone’s life, why would you say no?" Hannah Jefferson, who studied BNURS Adult Nursing, acted as a Lead Instructor in the previous academic year, says: “It's so amazing to hear when any of us put our training into practice. "The benefit of this training is the saving of lives, and our students are out on the streets armed with the knowledge that they need to do this." The Peer Support Programme is managed by colleagues in the Teaching and Learning Support Office, part of the Directorate for the Student Experience.